For a family favourite alpine resort which really does have something for everyone, look no further than Pralognan La Vanoise. This charming village is a must for keen skiers during the winter but it is also becoming well known as an idyllic summer destination thanks to its scenic rural landscape and warm weather. Pralognan is located in the middle of the Vanoise National Park, which is a natural sightseeing haven nestled between the Tarentaise and Maurienne Mountains in the Savoie department of the French Alps. Vanoise was the first national park to be established in France and it remains one of the most popular and beautiful to this day. The village of Pralognan is the perfect setting to explore Vanoise, and it is in the heart of this resort that you will find our property, Les Jardins de La Vanoise. Our rustic chalet residence has an altitude of 1410m and a central location in the centre of the village, close to all of the best shops and amenities. The property boasts 33 chalet apartments, each large enough to accommodate up to 11 guests. The landscape of Pralognan is at its most beautiful during the warm and sunny summer season. One of the many exciting way to explore the magnificent views on offer is to go for a refreshing hike. There are plenty of hiking opportunities in Pralognan, with footpaths leading from the village and stretching right across the Vanoise National Park. However, these many pathways are not just a great choice for explorers on foot. Cycling and horse riding are also very popular throughout the whole Vanoise region and both are suitable for the whole family. Another child friendly activity is a visit to the Creux des Lanches Adventure Course. This is an outdoor sporty adventure centre with assault course routes available for both kids and adults. Creux des Lanches involves climbing tall trees, clambering over boulders, and travelling across suspended rope bridges, high wires, and zip lines. For children who love to keep active, there is also an introductory climbing centre for those aged four years and older, which includes one on one tutoring and family classes. 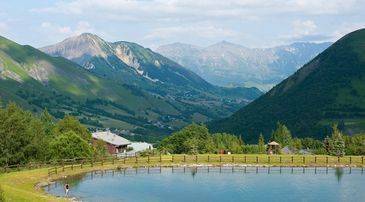 Leisurely sports on offer in this relaxing resort include a mini golf course and five large golf courses, such as Golf du Lac de Tignes and the Courchevel Golf Club. There are also indoor sports centres situated close to the village where guests can enjoy squash and tennis. Keen anglers can try fly fishing and other water-based activities such as canoeing and kayaking in the surrounding mountain lakes and streams. Summer trips to Pralognan La Vanoise are a wonderful opportunity to get up close and personal with the magnificent wildlife of the French Alps. Plenty of wild animals make their homes in the Vanoise National Park, and a short day trip from Pralognan can include spotting animals such as the Alpine Ibex and the Chamois. There are hundreds more small mammals and birds in this huge Natural Park, as well as very rare flowers and plants which thrive in the unique climate of the Alps. Savoyard cuisine is known for its delicious fondue and other cheese dishes. There are plenty of venues in this quaint resort where guests can enjoy the traditional dishes of the region. Thanks to the conveniently central location of Les Jardins de La Vanoise, the very best eateries in the area are just a short distance from your holiday property. The typical style of restaurants in this resort is rustic and cosy, with many venues boasting wooden interiors. Les Gentianes and the Restaurant La Bergerie are two of the most popular places to eat in Pralognan. Both of these options provide fondue and other local delicacies in a rustic setting. La Ripaille serves Italian cuisine and is a great choice if you're looking for a slice of pizza and some fine wine, while classic British dishes like steak and chips can be enjoyed Restaurant La Cascade in the centre of the village. Most of these bistros have outdoor terraces which open during the summer, allowing diners to soak up the sunshine and views. There are not many options for lively party lovers in Pralognan. Nightlife in the village revolves around the bars of local restaurants which stay open until late. There are activities the family can enjoy together in the evening; bowling and a trip to the cinema being the most popular. However, thanks to the excellent transport facilities which connect Pralognan La Vanoise to other resorts in the Rhones Alpes, it is easy to enjoy the nightlife options of neighbouring towns. One of the most exclusive nightclubs in the whole of the Alps mountain range is Les Caves in Courchevel. This is the closest venue to the village for a night out and is situated just over half an hour away by car. The La Plagne season runs from early December to the end of April. In 2015-16 the lifts started opening from December 12th and were due to close on April 23rd. The Paradiski dates were from December 19th to April 23rd. La Plagne offers passes for four hours, single days or six days. Passes are available for either La Plagne or the whole Paradiski area, to which it is well-worth upgrading if you are intermediate level or above. There's even an option to buy a 6 day La Plagne pass with one day in the Paradiski. Contact Ski France for discounted lift passes ahead of your visit. There are many options for ski hire, with several shops available in each village. It's worth booking online in advance to save money if you've booked with Ski France you can benefit from a 30% discount when you add ski hire to your accommodation booking. La Plagne is a major centre for ESF, the largest French ski school, which has a branch in every village. There are English-language schools too such as Oxygène and New Generation. La Plagne has plentiful childcare facilities, but do book ahead if you are relying on nursery care. 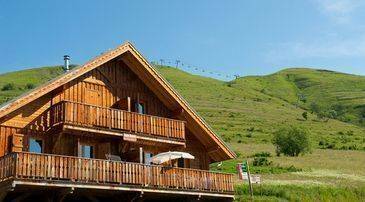 Nursery Les Bambins in Plagne Montalbert takes children from 18 months to six years. In Montchavin Les Coches, the Chat Bleu looks after children from 12 months to three years. Most of the ski schools offer ski gardens for children from about the age of four or five. There is very limited free parking in La Plagne. Street parking is pay and display. There are large covered car parks in most of the villages, with from under 100 to over 1,000 spaces. Hourly, daily, weekly and longer tickets are available and you can book ahead at some of them online. Remember to equip your vehicle with with either winter tyres or snow chains when driving to the Alps in the winter.